Three of those candidates–Tom Lord, Steven Strickland and Marcus Wiedower--are running against each other as well as against a Democrat in a Special Election on Nov. 7 for House District 119. The district is split roughly equally between Oconee County and Clarke County. The fourth–Houston Gaines--has only one opponent–a Democrat–in the Special Election for House District 117–consisting of three of Oconee County’s 13 precincts as well as parts of Barrow, Clarke and Jackson counties. Democrats Deborah Gonzalez in the 117th and Jonathan Wallace in the 119th were not invited to the GOP meeting, but they have been invited to three other candidate forums, including one scheduled for 6 to 9 p.m. on Monday at the Community Center in Veterans Park. All six have indicated they will attend the Monday evening forum. 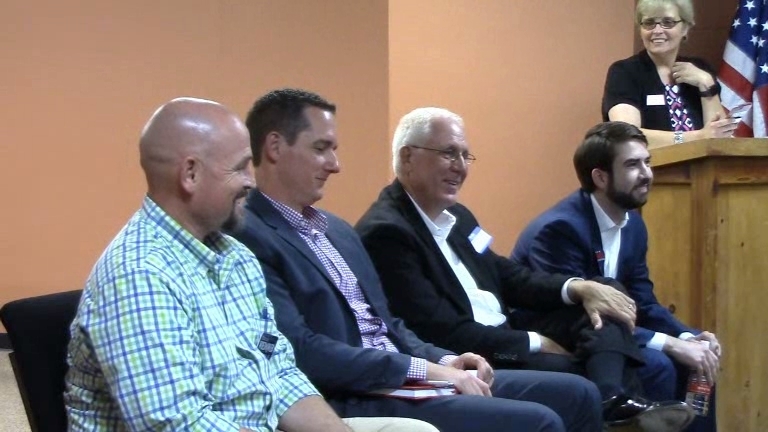 Party Chair Tammy Gilland afforded each of the four Republican candidates the opportunity to speak for 10 minutes at the regular meeting of the county Republican Party, held last Thursday at the Oconee County Chamber of Commerce, 55 Nancy Drive in Watkinsville. Gaines talked about his family background, including that he is the grandson of the late Superior Court Judge Joseph Gaines and that he was president of the University of Georgia Student Government last year. Lord explained how he had built his local business, Lord and Stephens Funeral Home, after having worked in the funeral business for others for many years. Stevens spoke about his experience in the communication technology industry, saying that he would bring skills to the legislature that would help it navigate issues upcoming and seize opportunities presented. Wiedower spoke about family, his service to the county Republican Party, for which he has been Second Vice Chair, his commitment to the community, and his work as a custom home builder. “I’m going to do what I can to support our northeast Georgia values, whether’s that defending the second amendment, whether that’s protecting innocent, unborn children, doing what we can to continue those important efforts to insure that we’re not overspending what we’ve got in the state coffers,” Gaines said. He said SR 316 needs to be upgraded to a limited access roadway. Lord said he wants to make sure jobs are plentiful, wants to maintain the quality of schools in Oconee County, and supports local control of schools. “I want to make sure that we maintain the quality of life in our community that we are accustomed to,” Lord said. Strickland said the state is going to be focusing on issues of transportation infrastructure, intelligent highway systems, autonomous vehicles and smart cities. “This web of interconnected things has an impact on our lives,” Strickland said, and he said his experience would allow him to contribute to discussion in the legislature about these issues. Strickland said the two counties have great school districts, but he is concerned about the performance of schools elsewhere. “We need to do more for our rural communities,” he said. He said it is important that the University of Georgia gets the state support it needs to continue to contribute to the state and region. “Our district has great, amazing schools,” Wiedower said. “Clarke County, in the last five years, they have raised their graduation rate 30 points. Here in Oconee County, annually, obviously we’re in the top--top in the state on all levels. “But we need to make sure no kids are dropping through the cracks,” he said. Wiedower called for more local control over state transportation spending and said that SR 316 should have been a limited access roadway when it was built. “Taxes, we’ve got to trim the waste,” Wiedower said. “If I’m honored enough to represent you in Atlanta, I’m not going to cave to special interest groups,” he said. At the end of the meeting, Gilland allowed five minutes of questions from the audience, and the first was from Bill Mayberry, an active member of the party. Mayberry noted that the legislature passed House Bill 280 allowing guns on campus in the last session but that there is discussion about changes to the law. “What is your opinion on campus carry?” he asked. I’ve transcribed the entire responses of the four candidates, in the order in which the candidates answered Mayberry’s question. Sarah Bell, Russ Page and I have organized the candidate forum from 6 to 9 p.m. on Monday night at the Community Center in Oconee Veterans Park, 3500 Hog Mountain Road. The four candidates for the 119th House District will be featured from 6 to 7:40. The two candidates for the 117th will be featured from 7:40 to 8:40. The University of North Georgia Student Government and the Oconee and Athens GOP will host a forum for all six candidates for the two House districts from 6 to 7:20 p.m. on Oct. 17 in Room 522 of the UNG Oconee County campus off Experiment Station Road outside Watkinsville. Gilland told me that the four Republican candidates have committed to attend and that Gonzalez has agreed to send a representative because of a prior commitment. Wallace also has a commitment, Gilland said, and is being asked to send a representative. The Federation of Neighborhoods, a volunteer community organization in Athens-Clarke County, is hosting a forum for all six candidates from 6 to 8 p.m. on Oct. 23 in the auditorium of the Athens-Clarke County Library, 2025 Baxter Street, Athens. I was not able to attend the meeting Sept. 28, but Bell, who is active in the Republican Party, did attend and recorded the video below. Bell said she counted 33 persons in the audience at the meeting. The initial comments from Gaines start at 3:40 in the video. Lord started speaking at 12:32. Wiedower started his comments at 36:35. The first question posed from the audience–on campus carry–was at 46:09. OCO: GOP 9 28 2017 from Lee Becker on Vimeo. Good, clear layout of the presentations. Does not appear to be a great deal of difference among the GOP candidates. Disappointed that there isn't a debate scheduled between the GOP candidates and the Democratic candidates. It isn't a debate, but the six candidates will face questioning from the audience starting at 6 p.m. on Monday at the Community Center in Oconee Veterans Park. I hope to see you there. Bring your neighbors.